Click for the .pdf mailer of the content on this page. For more than 300 years, St. Peter's has stood here at the crossroads of Freehold, serving our vibrant community. We have a rich past, full of great work, and we dream of expanding on our tradition of seeking and serving Christ in all people. However, our current parish house, which has served us well, has reached the end of its useful life. As a congregation, we believe that now is the time to act and move forward! Join us in "Building Crossroads" at St. Peter's Church as we lay the foundation for the next 300 years of service! Build our new Crossroads Center, including more modern, accessible facilities for meetings or classroom space, an up-to-date kitchen for meal programs and catering events, and a 50% larger space for community gatherings and worship possibilities. Remove the majority of the existing parish hall and create an open space which complements and enhances our historic church building and improves visibility to the community. This space may also incorporate a columbarium and/or memorial gardens. Redesign and renovate our sacristy and music spaces improving storage and organization. Refurbish the church interior with painting and needed repairs. Estimated total project cost: $1.95 million. a 50% increase in hall seating to serve meals to those in need, hold meetings, and provide event rental opportunities to the community. all our members and guests having full access to our new facilities and services through ramps, stairs, or elevator. what up to 7 flexible meeting spaces accommodating up to 155 people could provide for Christian Formation classes, after-school tutoring programs, and community events. a full basement, offering 3500 square feet for storage and the opportunity for future development based on ministry needs. Imagine a spacious, multipurpose assembly room with flexible seating options and presentation equipment for congregational, community, or private events. Imagine a modern, commercial style kitchen that allows for the expansion of our feeding programs and services for the homeless, hospitality to the congregation and guests, as well as increasing revenue through rental events. 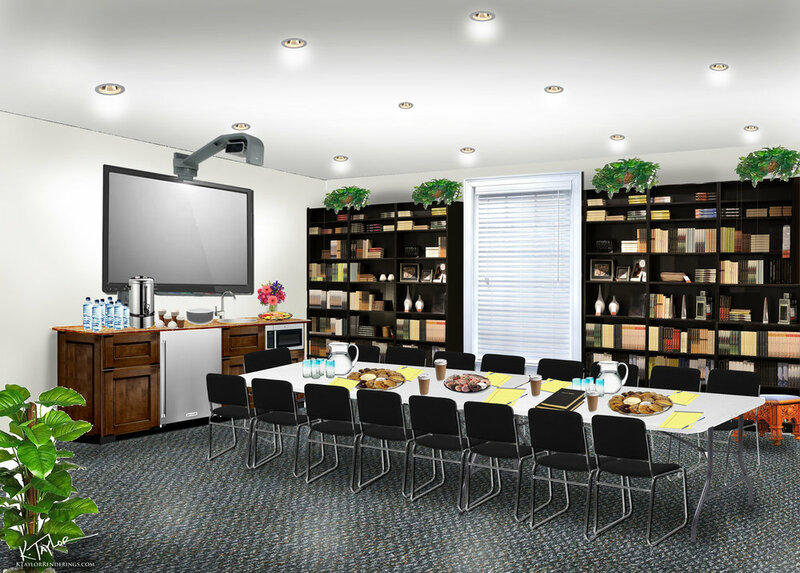 Imagine flexible meeting rooms with spaces to serve all the needs of parish groups and Christian Formation and providing conference space for community groups and non-profit organizations.